Padding on the back of the hand and wrist make blocking kicks a breeze. 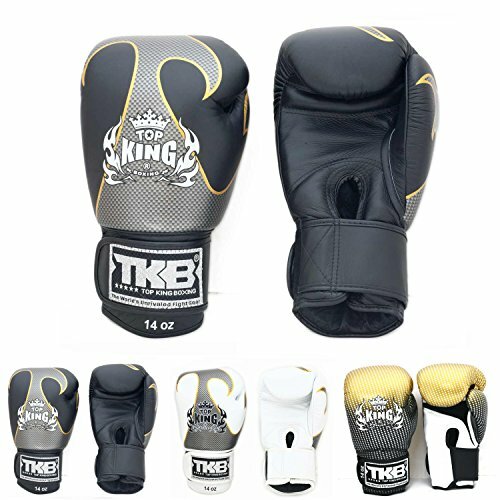 Top King is one of the most widely known and recognized brands in Muay Thai and combat sports around the world. Based in Thailand, they’ve built their reputation based on their quality gloves and shin guards which have the perfect combination of flash and protection, giving them an individual and unique style. Up for review here is their Superstar “AIR” boxing gloves which is the same glove as their regular Super “AIR” gloves, but with a new star design printed on the surface of the glove which is sure to set you apart in the gym from everyone else. Out of all of the gloves I’ve ever had the pleasure of putting on, these are the most comfortable I’d feel in if I was forced to hit a brick wall every day. The padding on these could probably be put up there with the top boxing gloves in my opinion. This would make them not just good for Muay Thai, but also traditional Western Boxing where only punches are thrown. There were some days where I would end up late to train and rather than taking the time to put on my hand wraps (not recommended), I’d throw these bad boys on in a hurry, jump into class, and barely notice the difference. And after training, my hands would be just as in good shape as before I started. Not many gloves can say that. 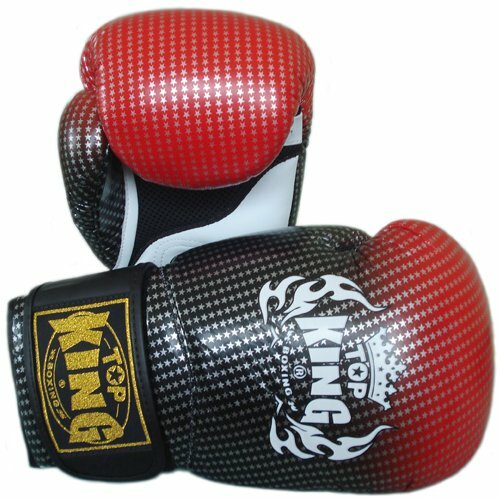 Top King uses a multi-layered molded shock absorbent inner foam padding which excellently protects your knuckles, fingers, and thumb from punishment while hitting the heavy bag or focus mits. While the protection is second to none, some may dislike this glove for heavy bag or mit training as they are a bit “pillowy”, so you may not receive the feedback or snap/pop that you would with some of the other more streamlined gloves. I feel these gloves really shine as a sparring glove due to their heavily padded knuckle, upper hand region and wrist region for blocking kicks. After sparring against a training partner wearing the Top Kings, these would definitely be in my top 3 list of gloves to be hit with. The 16 oz variant offers more than enough protection and padding for both you and your partner to safely train with on a regular basis. In fact, I was shocked by the level of protection and padding even the 12 oz variant provides. The 12 oz feels more in line with the padding of a larger 14 oz glove, while still being lightweight. Again though, with more protection comes a little of a tradeoff. The gloves, especially in the 16 oz size are a little on the wider side. It makes them great for those who love using high blocks/guards and whose defense may not be as sharp yet. Those looking to work on precise defense work may favor a more streamlined Muay Thai or western glove especially when it comes time to use smaller competition or MMA gloves. I would say these gloves are a little wide to use for MMA style sparring and tight clinch work. The wideness may also make it more of a challenge to break through guards of opponents with tight guards. While I do not consider them “bulky” by any means and their light weight size more than makes up for their width, the personal style of the fighter/buyer may dictate whether you like the previously discussed tradeoffs or not. The smaller hand compartment may be the area which is of most concern for potential buyers. These gloves at first are tight, really tight. It appears these gloves were made with the generally smaller Thai fighter’s hand in mind. Although I’m on the shorter and stocker side and had no problem at first with the tight fit which I in fact favor, for those with longer fingers and bigger hands it may take some time to break in. One of my training partners who is on the taller side in the 6 foot range had absolutely no problem with his 16 oz variant of these same gloves fitting though. And other taller training partners who I have let use my gloves haven’t complained of any issues either. If you’re concerned about fit, you may want to consider going up a size depending on your needs, but there should be no issues after a proper break in. After several weeks of training, they generally conform to the fit of your hand. Part of what keeps this glove so cool is the thin mesh material used on the underside for the palm area. Advertised by Top King as its climacool technology to keep hands cool and dry, it really does what it intends on those long, hot, or grueling training days. The mesh material also makes drying out these gloves a breeze and relatively quick. The inner material also doesn’t rub against your skin very easily which keeps chaffing to a bare minimum. The one con to be aware of with this material though is that it does have the potential to scratch your training partner if you favor clinching a lot. Even though the mesh material is relatively soft, many favor a solid leather underbelly on the palm of their gloves for this reason. This glove also features a one piece connector of leather which keeps the thumb attached to the main part of the hand/fist compartment. It is both durable and allows for easy opening of the hand in order to clinch, pat, parry, and block punches while keeping the thumb in place. The wrist support on these gloves is in the medium range. While they ensure your wrist and fist are locked into place, they are not as long as some other brands which extend further down your wrist and truly keep your wrist from moving. The upside is that there is plenty of padding around and on the Velcro strap to make blocking kicks easy and its strong enough to where you shouldn’t see it falling apart anytime soon. These gloves as you can notice from the interior tag, are made from genuine leather. Actually, 100% cow skin leather to be precise. Their durability certainly shows as well. As a heavy bag and focus mit glove, these can take quite a beating. After using them for several months, I haven’t noticed any bottoming out of the glove. In fact, I would say it takes at least a solid few weeks to break these gloves in to where the padding is just right. While a very tiny section of the coloring on the knuckle area has scratch off, this is hardly noticeable and the gloves are just as good as when I purchased them. I have yet to encounter any fraying, tears in stitching, rips, or graphics coming off. If you needed a multiple purpose glove for the heavy bag, focus mits, or sparring, these would certainly fit the bill and should be on your list. Simply put, this is one of the most stylist looking designed gloves I’ve ever seen. For some it maybe too flashy, but for others like myself, it had that perfect combination of multi-color scheme and flair without being too over the top as some Top King, Raja, and Fairtex glove designs can be. The colors that these gloves can be found available in are red/black, silver/black, gold/black, and blue/black with star printing across the surface of the glove. 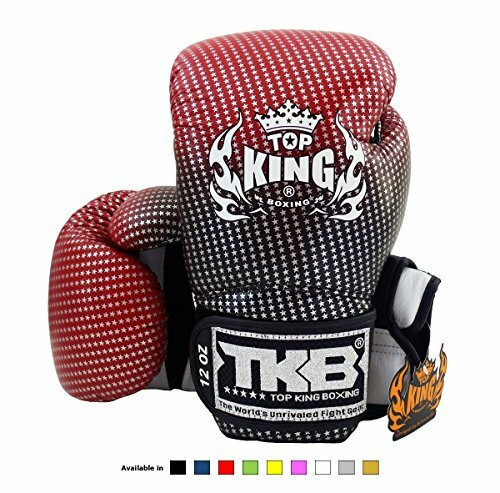 Across the hook-and-loop Velcro closure in big bold print is “TKB” for TOP KING BOXING and glove size which makes for identifying glove size a breeze. The Top King Super Star Airs are on the cheaper end of the glove, but as they are made in Thailand, expect higher shipping costs. Those in the higher price range will generally have free shipping. This is a very good price for a quality Thai or boxing glove though which is built to last you the long haul. And compare to some other Thai brands, these gloves are relatively easy to come by in availability. Top King’s “AIR” gloves are a true workhorse made for punishing the heavy bag, focus mits, or heavy sparring while giving you the peace of mind that your hands and sparring partners are nice and protected. Due to the padding, these would be great for those practicing MT or western boxing alike. Buyers with previous hand issues should also check these out or anyone in general who wants a glove that will set them apart from the crowd while giving them the performance to match. Gloves are relatively wide, those who want to easily break through their opponents guards or fine tune their defense may want a more streamlined glove. Jhullian purchased this pair of Top King Air boxing gloves himself for the full price. This did not influence the outcome of this review.